What girl doesn’t love themselves a cute leather jacket. A leather jacket is one of those pieces that looks good with everything. You can wear it over your most feminine dresses for a cool look or you can wear it with jeans and boots for that biker chic look. It used to be hard for a plus size girl to find cute leather jackets that fit her body. Now, times have changed. This season leather jackets have been updated with feminine details, striking colors and flattering fits. All in plus sizes! Retailers are finally catering to us in the leather department and SC has found 5 super cute leather jackets to flatter your curves. Checkout SC’s top 5 leather jacket picks. Allow your curves to standout in this round neck, double breasted, ruffled him jacket. A belted biker style jacket in teal looks just as chic with trousers as it does with jeans. 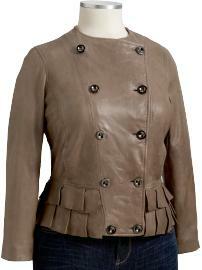 The classic one zip, one button collar biker jacket is a great option for that biker chick look. A classic leather pea coat is ageless and timeless.